Description: Access Get Password and Remove is an easy-to-use utility with powerful functionality for recovering lost or forgotten MS Access MDB database passwords. The key features are: retrieving the password up to 20 characters long, multi-encoding support, hexadecimal password dump, drag-and-drop technique, changing the password, removing the password, saving the unlocked password to a text file. Description: Access Password allows you to recover passwords which MS Access databases (.mdb, .mde, .mdw) are protected with (including Multilingual and Unicode ones). Recovers users and admin passwords from workgroup information file (.mdw)("System database"). Recovers Non-standard database user-level security owners names and IDs when workgroup database (security, sytem, .mdw) is lost or corrupted! Description: ActMon Password Recovery XP - Reveal any password with this popular password recovery utility that decrypts and displays the passwords behind the asterisks on ALL Windows systems. It works automatically on Web pages, Windows 9x/NT and Windows 2000/XP systems. Recover passwords hidden behind "*****" asterisks. Activate the utility, drag the mouse cursor onto the password field and your password is revealed instantly. Description: The AirGrab Password allows you to create random passwords that are highly secure and extremely difficult to crack or guess due to an optional combination of lower and upper case letters, numbers and other symbols. Generate strong passwords by one click for access points, WEP and WPA encryption in WiFi Networks, websites, servers, routers and etc. Including numbers and special characters in a mixed case password. Description: The AirGrab Password PRO allows you to create random passwords that are highly secure and extremely difficult to crack or guess due to an optional combination of lower and upper case letters, numbers and other symbols. Generate strong passwords by one click for access points, WEP and WPA encryption in WiFi Networks, websites, servers, routers and etc. Including numbers and special characters in a mixed case password. 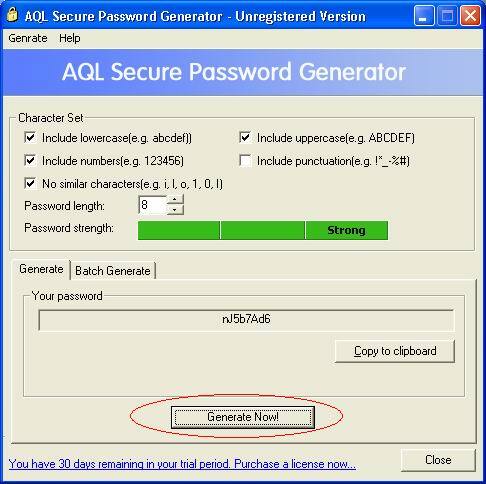 Description: AQL Secure Password Generator(<a href=http://www.aqlsoft.com > http://www.aqlsoft.com </a>) allows you to create random passwords that are highly secure and extremely difficult to crack or guess due to an optional combination of lower and upper case letters, numbers and punctuation symbols. Features: Generate lowercase, uppercase, number or punctuation passwords. Copy password to clipboard. Support for batch generating, etc.. Description: Asterisk Password allows you to read passwords hidden behind the asterisks in dialog's password fields. Asterisk Password uncovers hidden passwords from password dialog boxes, web pages and ActiveX controls. Another great feature of this program is the ability to display Protected Storage contents. Protected Storage is widely used by a range of Windows programs and Web services to store confidential information as well as passwords. Description: Windows stores your frequently used passwords. The password is staring right at you, but it's hiding behind a row of asterisks - ****. Asterisks Password Viewer is a program that lets you see the actual password behind the asterisks! It can recover passwords to such programs as Microsoft Outlook / Outlook Express, The BAT! and other e-mail clients, FTP clients such as CuteFTP, FlashFXP, etc. Microsoft Internet Explorer password recovery support. 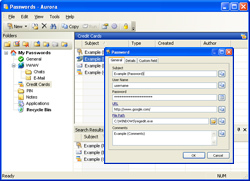 Description: Aurora Password Manager is a full-featured solution for storing website and e-mail access passwords, credit card numbers and other sensitive data. Multi-user and privilege management support makes it an ideal solution for both corporate and individual users. A built-in advanced password generator helps you to create 100% secure passwords, and the Internet Explorer toolbar plug-in provides automatic web-form filling functionality.